FraxRF is a Fractional Radio Frequency or non laser resurfacing treatment used for wrinkles, acne scars and stretch marks removal, as well as skin tightening. The treatment can be either non- invasive or invasive with a minimum downtime of 3-5 days. Treatment areas include the Face, Neck, tummy or leg stretch marks and arms for loose skin. How does Sublative FraxRF Work? To achieve the best possible results, the energy, whether laser or light, must be delivered below the skin without overheating the top layer of the skin. This has been the challenge with other more aggressive treatments because they work by overheating the top layer of the skin to the point of complete ablation (removal), forcing new skin to develop. Sublative FraxRF Rejuvenation uses fractionated bi-polar radio frequency to penetrate through the skin, sending more energy beneath the surface of the skin to maximize collagen production, all while keeping the top layer of the skin intact. This is an important factor in why it’s safe for all skin types, and requires less downtime than other treatment methods for the skin to heal. Sublative FraxRF Rejuvenation is the “all-natural” approach to enhancing your youthfulness. Unlike other non-aggressive cosmetic treatments such as Botox, fillers, or chemical peels, FraxRF Rejuvenation works from the inside out by stimulating cell regrowth. Thus results with FraxRF last longer and can be further enhanced with yearly maintenance treatments. A full-face treatment session takes less than 30 minutes. Proven safe and effective on ALL skin types and degrees of pigmentation. Whats Unique about the FraxRF? 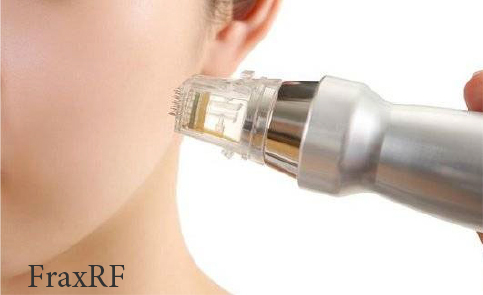 The FraxRF also offers a non-invasive handle called FraxRF “Thermage”. This is perfect for the person that wants the same results as the invasive treatment but without the downtime/recovery time. The FraxRF Thermage treatment usually requires 2-6 sessions to see the same results as one of the FraxRF treatments. Full face Thermage $199 and can be added to any of our facials. Goes great after a PRP#2 facial.